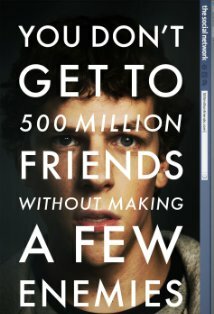 I finally broke down and saw The Social Network, despite my personal prohibition on ever seeing another movie where the dialogue includes the cheesy line, “This is our time!” The movie is a dramatization of the founding of and eventual lawsuits over Mark Zuckerberg‘s founding of Facebook. My first thought was that this movie should do for Facebook what Wal-Mart: The High Cost of Low Price did for Wal-Mart in terms of negative publicity. And at the end of the day, that’s probably apt. Anyone who’s seen the movie can easily see the negative impact that Wal-Mart has had on communities and will deplore many of its corporate practices. They might even remember that as they stand in line at the checkout — but they won’t stop shopping at Wal-Mart. So maybe the comparison works. When something has that much momentum, you can change your opinion of it, but you still end up supporting it one way or another.